Put an end to "buddy punching" with Owl Time Clock's advanced time tracking solutions. Put an end to “buddy punching” and eliminate the frustration and cost of managing employee badges with Owl Time Clock’s biometric time clock which is integrated with both the Clock in the Box™ Pro and TimeQPlus™ Time and Attendance Systems. 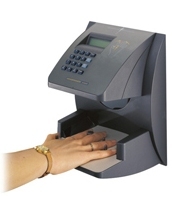 Eliminate “buddy punching” and ensure payroll accuracy with the Biometric Hand Punch Series – Hand Punch terminals work by measuring the physical size and shape of each employee’s hand, converting the data into mathematical equations and storing it as a template, then matching it to their actual punch. Ideal for businesses of any size, a biometric time clock can handle simple in/out punches, as well as capture accurate labour costing information. The Biometric Hand Punch series grows with your business, offering optional employee capacity upgrades and TCP/IP connectivity for network environments. For more information on Clock in the Box™ Pro or Time Q Plus, visit our section on Swipe Card Systems.